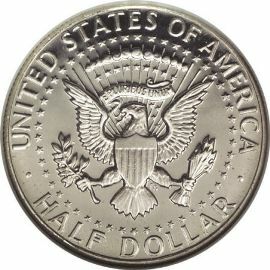 The second variety of Kennedy Half Dollars was made at the US Mint from 1965 to 1970. These coins are identical in design to the 1964 issue. The major difference is that coins of this date range have a different composition than the earlier issue. 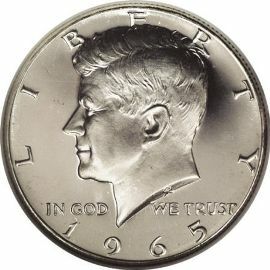 Type 2 Kennedy Halves are similar to our clad coinage of today. The outer layers of the coin are made up of 80% silver and 20% copper, while the inner core is 79.1% copper and 20.9% silver. inscription "LIBERTY" encircles the central devices and "IN GOD WE TRUST" is positioned above the date. The reverse of the coin is identical to that of the earlier issue in 1964. It carries Frank Gasparro's rendition of the Presidential Seal. Inscriptions include "UNITED STATES OF AMERICA" around the top half, and the denomination "HALF DOLLAR" at the base of the coin.